Customers typically head to big, 24-hour Laundromats for their convenience, and you can make yours even more convenient with a custom laundry detergent vending machine. 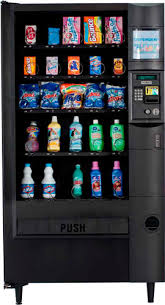 Custom vending machines that have single-use detergent options can benefit your customers as well as your business. Here’s how. Some Laundromats choose to sell single-use detergent from behind the front counter, which can be a hassle for employees as well as customers. Employees are not always stationed in that exact location, and they are often pulled away from other duties to run back to the front. An on-site vending machine also saves your customers the hassle of waiting in line or heading down the block to buy detergent from the nearest convenience store. Custom vending machines are available all night long, just like your 24-hour Laundromat, without the need to constantly man the machine or have an employee at the front counter. Thanks to the different styles and sizing options of automated supply dispensing machines, you can personalize a machine that works specifically for your business. Choose from a variety of different laundry detergents, fabric softeners or other supplies to meet customer demands. You no longer have to spend time and energy keeping track of the different type of laundry products you have in stock. Pick a machine equipped with iQ technology and the vending machine takes care of inventory control you. Instead of standing at the machine at reviewing the stock, iQ technology lets you log in to a your personal customer account and access information from its cloud-based system.